Credits: Direction, production and script: Laura Mulvey and Peter Wollen; Camera and lighting: Louis Castelli; Sound and porta-pak: Larry Séder; Production co-ordinator: Sharon Russell; Titles and animation:Don Lembeck; with Debra Dolnansky and Michael Thomas (together with the Northwestern University Mime Company directed by Bud Beyer); Peter Wollen and Grace McKeaney. 16 mm, Eastman 7242, standard ratio, 95 mins. Each section of the film is in one continuous take: ie, two reels added together with an ‘invisible' junction. 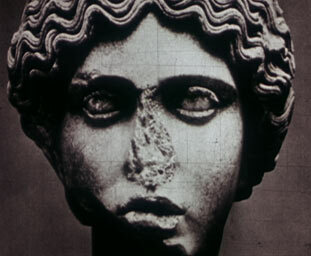 Section 1: A mime of Kleist'sPenthesilea,  shot with a static camera at a fixed distance. Section 2: Peter Wollen speaks/reads the words of the directors. As his speech develops, the camera gradually disengages itself from the speaker and weaves a complex web around him/independent of him. At times, the camera picks up cue cards from which the speech was read, but sometimes the text on the cards is not identical to the spoken text. Section 3: A complex arrangement of images of paintings, sculptures, bas-reliefs. comic strips, etc on the theme of the Amazons. The transitions are effected with animated wipes and maskings. The sound track presents the 'birth' of a new form of language. Section 4 : An early silent film called What 80 Million Women Want,  superimposed on a medium close-up - in colour - of a woman's face. The woman speaks the words of the feminist Jessie Ashley. At various points the sound track is taken over by the sound of machinery and women's voices talking indistinctly. Section 5: The screen-image contains four video images. Each video image presents one of the four preceding sections. However, a fifth tape has been added and sometimes displaces one of the other video tapes. In the fifth tape, the camera circles around the stage-performance of the mime and adds images of the Penthesilea-actress taking off her make-up and addressing the camera. The film-image occasionally zooms in on one of the four video images, and the sound track contains similar ‘zooms' in on accompanying sound tracks of the four first sections.